The town of Uderns is located in the midst of the Zillertal Alps in Austrian Tyrol. With close proximity to ski resorts and hiking trails the town is especially popular with nature lovers and activity holidaymakers. This makes it all the more important for locals and tourists alike to avoid a sense of mass tourism - as well as hotel resorts that block the view of the expansive landscape. This is why the construction of the Zillertal sports resort, which was completed in 2014, focused on high-quality materials and a design that allows optimum integration into the surroundings. The basic concept for the architectural design of the hotel resort was the idea of a “roofed” square in the green: an artificially created place, embedded in the landscape, which is a part of the surrounding green space. The aim of the new building was to provide a panoramic view of the Zillertal Alps and the area of the newly designed golf course of Uderns. To provide a unique view of the Zillertal mountain landscape and the green golf course, large glass surfaces were used: in addition to the large tilt/slide doors, around 350 m² of facade and over 100 window and door elements provide for a great view. Particular emphasis was placed on system compatibility to combine all elements required and to meet the demanding planning requirements. 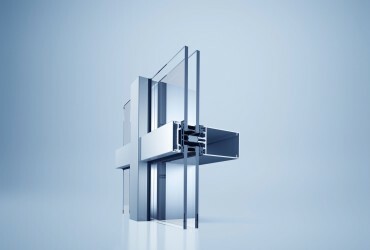 For example, the heroal W 72 window system could be easily integrated into the facade solution heroal C 50 in mullion-transom construction. Both systems meet the most stringent requirements for effective thermal insulation - an important aspect for demanding hotel guests in both summer and winter. Solar thermal energy, a photovoltaic plant and green roofs characterise the ecological standard. The facade solution, with its miniscule viewing width of only 50 mm also meets the high demands placed on the stylish design. In the interior of the hotel, the atrium is also spacious and transparent; in addition, it provides the guests with sufficient daylight. Thanks to the generous window elements, the green courtyards offer a sense of space, interwoven with the landscape and with a flowing transition between the surroundings and the interior. But not only the window and facade elements provide a panoramic view of the unique landscape. The tilt/slide system heroal S 77 SL is an almost invisible link to nature and extends the living space beyond its real limits. Maximum viewing range that gives a new feeling of space and gives the visitors the feeling of being in the middle of nature. 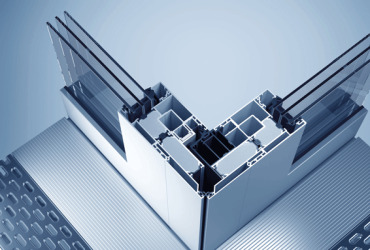 The innovative system solution for the latest generation of sustainable, aluminium windows. 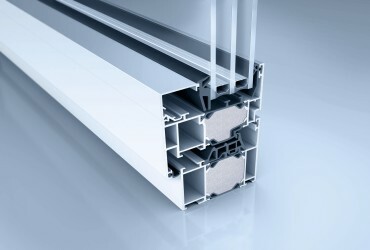 Perfect combination of transparency and heat insulation.